Welcome to the Screen Rant Box Office Prediction. Every week we put together an informal list of box office picks for the upcoming weekend - to offer readers a rough estimate of how new releases (and returning holdovers) will perform in theaters. For a recap of last week's box office totals, read our box office wrap-up from Ant-Man's opening weekend - and scroll to the bottom of this post to see how our previous picks measured up. Full disclosure: Box office predictions are not an exact science. We acknowledge our picks may not always be correct. For the sake of offering a jumping off point for discussion, here are our picks for the weekend of July 24 - 26, 2015. This weekend, Pixels opens in more than 3,500 theaters, Paper Town debuts in 3,100 locations, and Southpaw will play in 2,750 theaters. In limited release, Samba and Unexpected both open on an unspecified number of screens, Phoenix opens in 2 theaters, and The Vatican Tapes debuts in 400 locations. Coming in first this week should be Pixels, the video game-centric action/comedy that stars Adam Sandler and Kevin James. Usually, the presence of those two actors encourage moviegoers to stay away, but this case seems like it will be a little different. Directed by Chris Columbus, the film looks to be a fun time filled with escapism that audiences of any age can enjoy. Children will obviously appreciate the colorful characters that are wreaking havoc on-screen, but the adults taking them to the theater should get a kick out of the nostalgia the movie seems to be offering. Calling back to several iconic game characters, it will be just as thrilling for them to see the likes of Pac-Man and Donkey Kong up on the big screen. 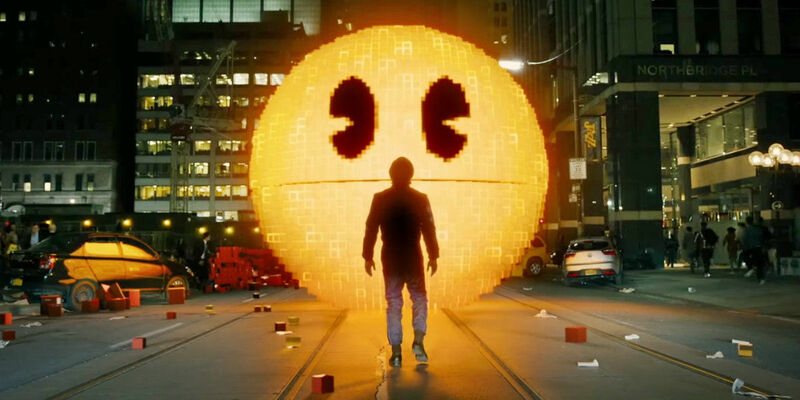 In the end, that cross-generational appeal should help Pixels become a solid box office hit. It's not expected to light the marketplace on fire, but analysts currently have it pegged for a $54 million opening, which is in line with what Ant-Man did last week. Again, the cast may give some pause, but the concept seems unique enough to draw viewers in with old school excitement and humor dashed in for good measure. Our pick for second is Paper Towns, a film that's adapted from a John Green novel. If that name sounds familiar, it's because last year's The Fault in our Stars had a very successful box office run, bringing in $124.8 million domestically (it even beat Tom Cruise's Edge of Tomorrow for the opening weekend crown). It's clear that the author has a large enough fan base that will come see his work brought to life cinematically, and with Paper Towns already generating an early positive critical response, that will only help Fox sell the project to the uninitiated. Though not expected to be as big as Fault, Paper Towns should still post healthy numbers in its own right. Tracking is currently at $31 million, which is a great figure for a "small" movie like this coming out towards the end of the summer season. It seems to have its target audience locked in, and it will get a small boost from those looking for counter-programming from the big scale genre pictures. There's always a crowd for a romantic drama, especially one looking to draw in younger moviegoers. Look for last week's champ, Ant-Man (read our review), to fall to third in its second weekend. The latest installment in the sprawling Marvel Cinematic Universe had a good debut, but it was "low" for Marvel standards at $57.2 million. That figure is not as bad as it initially seems, but it indicates that there isn't as much interest and enthusiasm for a superhero who talks to ants as there was for say, a talking raccoon and his tree pal. Ant-Man seems destined to become one of the lower-grossing Marvel movies. Big tentpoles always see a decrease in sales after they come out, and the film's soft opening means it probably lacks the legs to pull off a repeat. Our pick for fourth is Minions (read our review), which came in second last week with $49.2 million. The Despicable Me spinoff has some competition now for family audiences, but the popularity of the eponymous creatures means it won't have any trouble attracting its target demographic for at least another week. Business is still going strong, and even as the numbers slide a bit, it's still raking in cash. Rounding out the top five should be Southpaw. The boxing drama has turned some heads thanks to another remarkable Jake Gyllenhaal transformation, but its selling points seem to stop there. The trailer received a lot of criticism for spoiling key story elements, and early reviews have painted it as nothing more than a by-the-numbers sports film that we've seen countless times before. That's not to say it will be a bad film, per say, but buzz about this one seems low. Tracking is currently set at just $14 million, meaning it will have an uphill challenge facing its competitors. We were very close to predicting a perfect lineup. If we had only switched where we had Inside Out and Jurassic World, our record would have been clean for the week. Next Week: Mission: Impossible - Rogue Nation, Vacation and more!